Rebecca Mulvah is happy to be back home in her village of Balakatala. Rebecca, 34, fled to camp out in the bush, when rumors that her village would be burned by people from a neighbouring one filled her with terror. Her village had Ebola. Fear of catching the often-fatal virus is enough to make anyone tremble and cry. Ebola is terrible. But for many Liberians with memories of the civil war – which ended only in 2003 – fear of their neighbours added another burden. It brought awful memories. Caritas teams responded by bringing hygiene kits and life-saving information about how to stop the spread of Ebola to Balakatala. Rebecca and her daughter Blessing, 2, were both survivors when they fled into the bush in November 2014. Rebecca had to carry with her the pain of also losing her son and her mother. 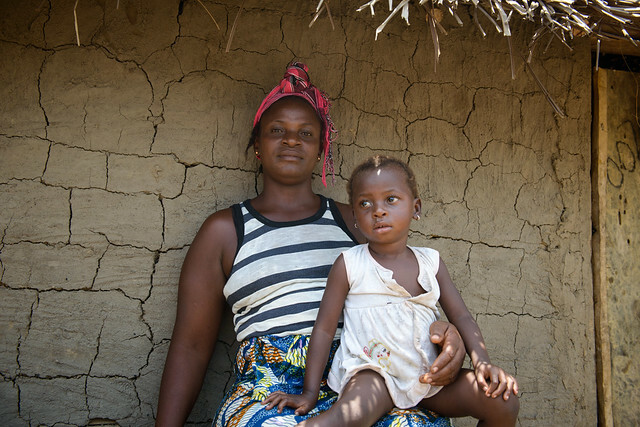 Her mother had cared for the first person to become sick with Ebola in Balakatala. Betty Kekulah has also taken a hard knock from the stigma surrounding Ebola. She’s had to shut her small shop as no one will buy from her after she survived the virus. Betty, 31, caught it while nursing a boy who she believed had leprosy. Betty knows from her own experience that the stigma endured by Ebola survivors is a thorny problem in Liberia. But she also knows that Caritas and other organisations are campaigning hard to show that survivors need support – not shunning. This helps her finds the strength to carry on in the aftermath of Liberia’s worst ever health emergency. There are 7 orphans in the Sephes family, 4 boys and 3 girls, aged from 4 to 24. They are supporting each other, unified by their grief and their courage. But it is an unbelievably difficult time for them and many other Liberians. At least four and a half thousand people died in Liberia – the worst affected country in West Africa. But no one knows the true figure as gathering information during the height of the crisis was extremely difficult. At 24, Melvin Sephes has a lot of responsibilities. He’s now the eldest in the family. He and his siblings lost their mother when the epidemic escalated in August 2014. Emmanuel, 21, comes next and then Prince aged 20. The boys had never recovered from their father deserting them. Suddenly, their mother was gone too. The last brother – Francis – is 15. 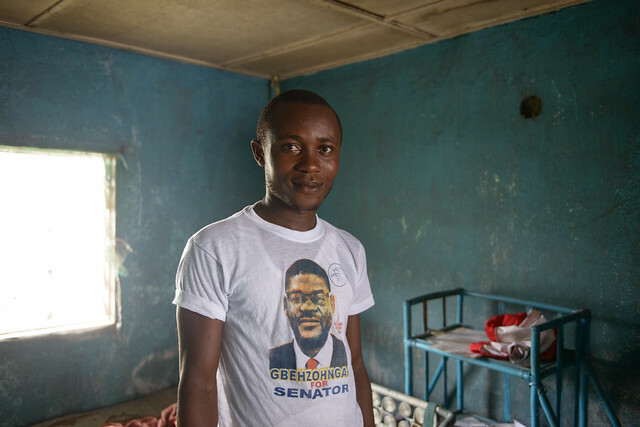 He was just a toddler when Liberia’s civil war ended. But the country was so devastated it found itself unable to cope when the worst outbreak of Ebola in history happened. At 18, Princess is the eldest daughter in the Sephes family. She is 18 and knows she too must shoulder responsibilities beyond her years. Their village of Korduah is remote, rural and poor and she has 2 younger sisters to take care of. Jessica is 8 and Divine, the baby of the family, is just 4. She doesn’t understand where Ebola came from or why it had to take her mother. Princess will have to assume her mother’s role but she shares her resilience and her hopefulness. She knows the 7 orphans are better off than many others as their grandfather, Quito, is providing them with their only source of income – rent money from a property he owns. Apart from charities like Caritas, Liberians are falling back on their extended families to help them through this crisis. Not far away from the Sephes family in the village of Old Field, Ebola also orphaned 17-year-old Sam. He lost his brother too. Sam and his two sisters – the three are triplets – miraculously escaped infection. Now the children – Sam, Doedy and Bayo – live with their aunt, Marline. She has taken in her nieces and nephews despite her lack of income. Marline, 39, is desperately worried about how she is going to provide for them as there are few jobs in Old Field and Liberia’s largely agricultural economy has taken a battering. Farmers have been unable to tend their fields in the traditional way – working together in what is known as the kuu system – as close contact was at first discouraged and then banned when quarantine was enforced. Many farming families ate their seed stocks to survive and now have nothing to plant for the next harvest. Caritas is distributing replacement seeds and tools and is cooperating with the United Nations World Food Programme to distribute emergency rations. The Jallah family is a rarity in the village of Mawah. Prince, 41, his wife Fatu, 21, and their 5-year-old son Henry were all infected with Ebola and yet all survived. A Caritas outreach team came to Mawah with hygiene kits and crucial messages on how to prevent infection spreading. Mawah was hit especially hard. 48 people in the village become sick and 36 died. But, the survivors are supporting each other, living together and providing comfort through the pain. 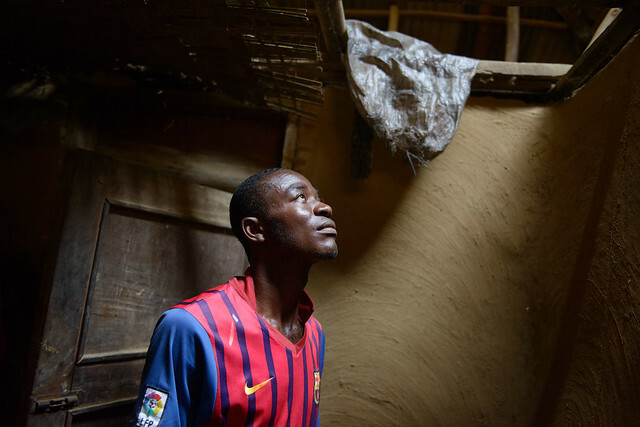 The Jallah family is one of 8 families – 7 of which have Ebola survivors among them – who share the same house. It’s one family to a room but in these hard up days after Ebola, it’s something to be together and alive. Some of them, like Prince, 41, farmed and fished for a living before being infected; he caught the virus from his dying sister. All their livelihoods have been badly damaged. Next door are the Sirleafs – another survivor family. Momolu, 28, caught Ebola caring for his sick son. The boy sadly died. So did his Momolu’s wife. Then, at the height of the epidemic in Mawah, his mother, Tenneh, also fell ill.
Fortunately she survived and Momolu’s 2 other children remained healthy. But, times are tough and money is scarce. Momolu hasn’t restarted his business taking fish to sell in the capital, Monrovia. His sold all the possessions he had to raise money for medical treatment for his family. Momolu is also nervous about travelling to other villages these days. The scars, which Ebola has left on the people of Liberia, will take a long time to fade.